Systematic conservation planning is the most widely used approach for designing conservation area systems and other types of ecological network. Thus, user-friendly decision support tools are needed to guide conservation planners when using this approach. CLUZ is a QGIS plugin that can be used for on-screen conservation planning and also acts as an interface for Marxan, the most widely used spatial conservation prioritisation software package. One of the most important ways of tackling biodiversity loss is by creating and effectively managing conservation areas ( Smith et al. 2018 ). However, most terrestrial and marine conservation area networks under-represent key species and ecosystems and are too small and isolated to be ecologically viable. Systematic conservation planning was designed to address these issues and uses decision science principles to identify where best to fill these gaps and produce ecologically coherent networks ( Margules and Pressey 2000 ). Systematic conservation planning commonly involves: dividing up the planning region into a series of planning units; identifying and setting targets for the important conservation features (valued species, ecosystems, ecological processes, etc); and; running spatial prioritisation software to identify the best sets of planning units that achieve the conservation goals. The most widely used software package is Marxan, an open source program that uses a simulated annealing approach to identify sets of priority areas that meet targets and maintain connectivity while minimising costs ( Ball et al. 2009 ). CLUZ is designed so users can create a conservation planning system for their planning region, which is based on a planning unit layer and text files that describe the conservation features, list the amount of each conservation feature in each planning unit, and describe how the planning units are spatially connected. CLUZ has functions to import the relevant conservation feature distribution data and specify which planning units are already conserved. Using these data, CLUZ then automatically carries out a gap analysis by reporting the extent to which the existing conservation areas meet the targets for all the conservation features ( Fig. 1 ). 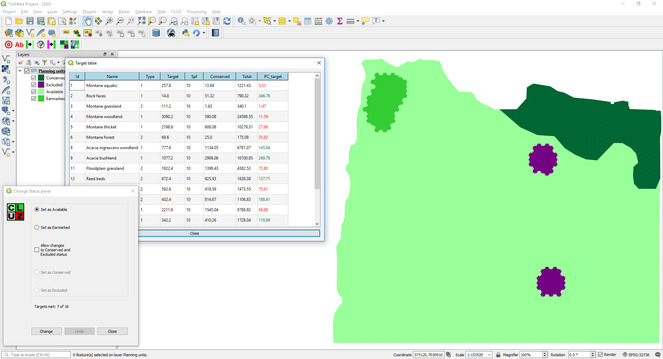 Screenshot of QGIS showing the planning units layer and CLUZ target table. The CLUZ target table provides details on all the conservation features, including the PC_target field showing the “gap” features that are currently under-represented. CLUZ has a number of functions to show the distribution of each conservation feature and identify planning units with high biodiversity richness ( Fig. 2 ). This lets the user identify potential new conservation areas and so fill any gaps in the conservation area network, thus meeting all the targets. This is done by selecting planning units using QGIS and then changing their status to Earmarked for conservation ( Fig. 3 ). This lets people investigate different options in real-time and understand how modifying current or planned conservation area networks would impact the different conservation targets and goals. 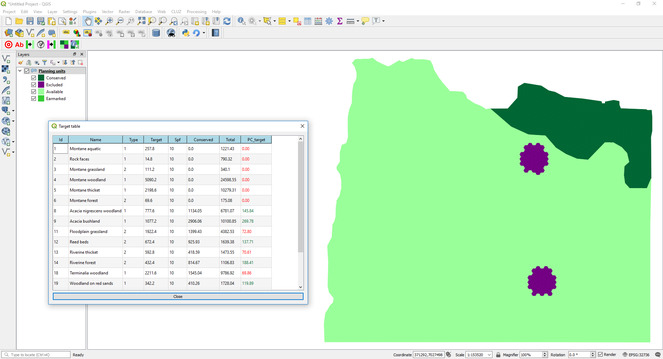 Screenshots of QGIS showing on the left, a CLUZ distribution map of one of the conservation features, and on the right a map of the number of conservation features found in each planning unit. Screenshot of QGIS showing the planning units layer, CLUZ target table and Change Status panel. The Change Status Panel was used to change the status of the patch of planning units in the northwest of the planning region from Conserved to Earmarked. This updated the target table, which shows that adding this new patch to the protected area network would meet the target for rock faces and would contribute towards targets for another five conservation features. CLUZ is designed to run the Marxan spatial conservation prioritisation software package. It has functions to: export all the CLUZ data into the correct Marxan format; decide on the analysis parameter values by running a set of calibration tools; run Marxan and display the results ( Fig. 4 ), and; import and display previous Marxan results. It also includes functionality to run MinPatch, a set of scripts designed to modify Marxan outputs so that every priority area is larger than a specified size threshold ( Smith et al. 2010 ). Screenshots from QGIS showing the two Marxan outputs displayed in CLUZ. The map on the left shows the best portfolio of planning units selected by Marxan, while the map on the right shows the selection frequency score of each planning unit based on running Marxan ten times, with planning units in red being selected in every one of the ten Marxan runs. this work was funded by the UK Government's Darwin Initiative. Thanks to Neil Burgess, Simon Ferrier, Nigel Leader-Williams, Tom Mullier, Hugh Possingham and Matt Watts for their advice in producing this and previous versions of CLUZ. This version of CLUZ built on a previous version developed for QGIS v2 on a project led by the UN Environment World Conservation Monitoring Programme and with funding from the Global Environment Fund.